Your Dermatologist’s Guide to Acne! Acne is the number one complaint in a dermatologist’s clinic! Unfortunately, in India, it tends to get treated quite late, resulting in excess scarring and marks! Read my advice and tips to prevent acne and to help eradicate your pimples for clean and glowing skin! Acne is a skin condition that causes pimples. This includes whiteheads, blackheads, and red inflamed patches of skin. In simple words Acne is Pimples! 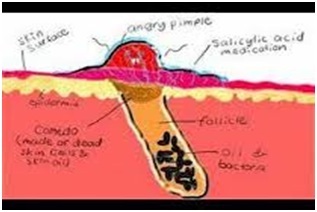 Our skin has pores (tiny holes), which connect to oil glands that are under the skin. 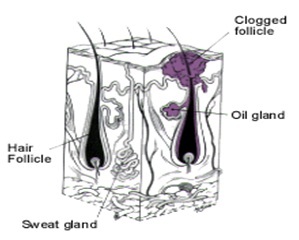 The oil glands are connected to the pores via follicles. Pimples grow when these follicles get blocked and infected! Acne occurs when tiny holes on the surface of the skin become clogged. These holes are called pores. Each pore opens to a follicle, which contains a hair and an oil gland. The oil released by the gland helps remove old skin cells and keeps your skin soft.When glands produce too much oil, the pores can become blocked and dirt, bacteria and cells build up. The blockage is called a plug or a comedone. If the top of the plug is white, it is called a whitehead and if the top of the plug is dark, it is called a blackhead.If the plug breaks open, swelling and red bumps occur known as pimples or pustules! Acne is easily diagnosed by the appearance of the spots and by their distribution on the face, neck, chest or back. However, there are several varieties of Acne and a doctor will be able to tell you which type you have after examining your skin. The most common cause of pimples is the disease ‘Acne Vulgaris'. The below ingredients are the most effective and also available readily in your chemist shop. · Salicylic Acid reduces the oil secretion while also unclogging follicles to help eradicate your pimples! So, clean your skin twice daily with a cleanser containing 2% Salicylic Acid! Make sure this cleanser has a skin-safe pH to ensure that your skin stays soft and strong! Also, look for a daily cream that contains at least 1% Salicylic Acid to ensure that you get double the effects from this active! · Retinoids such as tretinoin, tazarotene and adapalene are very effective for Acne. They act by making newer skin cells rise up to the surface, thereby shedding older cells. This ultimately reduces pimples while also reducing post-acne scars! However, these retinoids can cause dryness, redness and irritation. Retinol and Retinyl Palmitate are slightly weaker versions of Retinoids, however in the right percentage, they are highly effective against Acne, without the side effects! · Many people believe they are allergic to sulfur, however this is a myth! Sulfur is a natural element that is in every cell in your body. It is Sulfa drugs that can often cause allergy. Sulfa drugs use a large molecule with many different elements in it, and it is this molecule that can cause an allergy in some people. So, remember SULFUR is natural, SULFA is not! · SULFUR is a highly effective and natural treatment for all the causes of pimples. It acts on many different levels: it reduces oil secretion, it is anti-bacterial, it is anti-inflammatory and it is an exfoliating agent. Therefore, it works on all the points of pimple creation! That is why it is such an effective and time-old remedy for Acne! BioSulphur is an even better version of Sulfur, where the natural element Sulfur has been encapsulated in a skin-safe vehicle, making it gentler on the skin! Always remember to wash off your makeup at night! Otherwise it can clog up your pores, resulting in even more pimples! Try not to squeeze, scratch, pick, or rub the pimples. Although it might be tempting to do this, it can lead to skin infections and scarring! Also, avoid touching your face with your hands or fingers. If you wear make-up, wear products that are oil-free or water-based. Choose products that are labeled as being ‘non-comedogenic', meaning that a dermatologist has certified that there are no ingredients that can cause pimples in the product! Be healthy from the inside out! Eat lots of green vegetables and fruits and always remember to exercise! Dr. Kiran Lohia is a US trained M.D, specializing in Dermatology. She is American Board Certified with a degree in Aesthetic Medicine, member of the American Medical Association, American College of Physicians, European Society of Cosmetic and Aesthetic Dermatology, International Academy of Cosmetic Dermatology among others. Having additionally completed a Diploma course in Cosmetic Science through the U.K. Society of Cosmetic Scientists, Dr. Lohia has the distinction of being the first physician with both advanced Dermatology and Cosmetic Chemistry knowledge. She is the founder of Cosmedic. Please see www.cosmedic.in for more details. Dr. Kiran Lohia also practices in Vasant Kunj by appointment. Good post, I am currently fighting a giant zit,,,so annoying.